Basdi Hoskote :- Basdi hoskote is situated at verge of Krishnarajsagar reservoir in Mandaya district of modern Karnataka state.The place is situated about 30 kms from Krishnarajapete in south east direction and about 2 kms from Mavinakere village.The place is generally submerged under back water of reservoir Krishnarajasagar. The history of the place is corroborated by paleographic evidences till Hoyasala period of medieval Karnataka.Basdi hoskote has been celebrated for Jain affiliation since reign of Hoyasala monarchs Vishnuvardhan and Narsimha I . In present there are one colossal statue of Jina Bahubali of 15 feet and some Jain relics in the form of pillars, Yakshi-Yakshini sculptures and ruin of pantheons.The place can be accessible in only summer session. Two inscriptions has been recorded so far from the place about Jain temples of this place.There were two shrines in the village ; one of them is submerged in water of reservoir.One is situated in village in ruined state.Sculptures of Yaksh-Yakshini, Jina saviors, pillars and artifacts are scattered in nearby places.one inscription refers the grant of villages named Manikyavolalu, Manikyadodaluru respectively to the Jain temple "Mulasthana Basdi" built by Punisammaiah or Punisamayya under reign of Hoyasala Monarch Vishnuvardhan. Punisammaya who had title of Mahapradhana Dandanayaka was feudatory and minister of hoyasala monarch Vishnuvardhan and husband of jakkiyabbe. One inscription hailed from 1117 AD records that wife of Punisammaya Jakkiyabbe built a Jain temple on north of "Mulasthana Basadi". Jakkiyabbe was compared with Sita and Rukmini in inscription found from this place. An another inscription of 1165 AD records the endowments of Loom taxes and wet land by certain Somayya chief, an officer of Mahapradhana Heggade Shivaraja to the hoyasala jinalaya of Manikyavolalu village.The inscription was engraved on maanstambh of a Jain temple under reign of Hoyasala Narsimha I. The 15 feet Gommata staue decorated with creppers till his knees has curry hairs. The sculpture is enshrined in arche type room and now preserved by a iron gate protection. 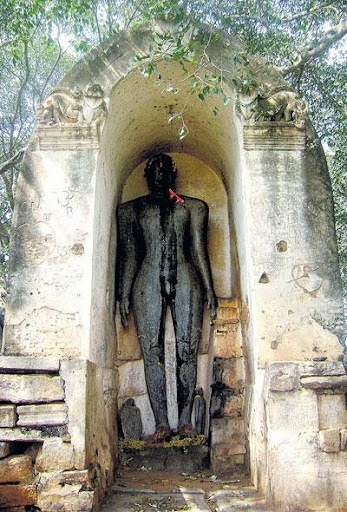 The gommateswara has celebrated position in Kannada history as attested by colossal statues of gommateshwara at Shravanbelagola,venur, karkala, gommatagiri, arettippur and Basdi hoskote.